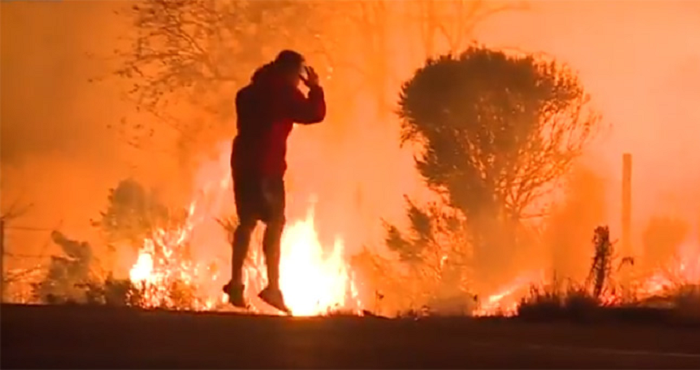 Man Bolts Towards Wildfire When He Spots Something MOVING In The Flames! One man (who wished to remain nameless) pulled over on the side of the road as the wildfire in California raged all around him. The smoke was thick in the air making it difficult to see…but when he spotted frantic movement in the bushes, he couldn’t keep driving. He got out of his vehicle and tried to see what it was, and someone caught his brave actions to share with the world. In the flames, he can make out a small, terrified rabbit darting around the rising flames. Its tiny silhouette bounding about in the bushes seems so helpless. The man was at a loss. The question of how to safely coax a wild animal away from the fire and into his reach was tough, but he couldn’t give up without trying. He cornered it between the flames and himself, finally able to cradle it gently against his sweater. Trying his best to protect it from the burning flames, he carried the animal to safety. He wasn’t interested in being interviewed or sharing his name with the photographer who documented his selfless actions. He only cared for the small animal that had found itself in an impossibly dangerous situation. When the story hit Facebook, people were impressed not only at his actions, but at his desire to remain anonymous. He’d done the right thing for the right reasons, and the story spread even farther because of it.